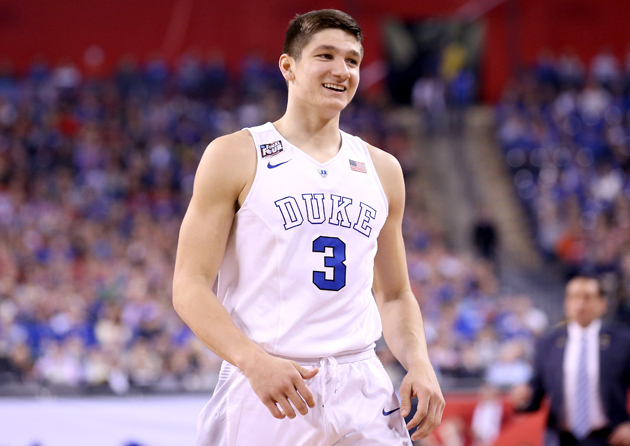 INDIANAPOLIS—Grayson Allen has two nicknames. The provenance of the first, bestowed upon him by his brethren in Duke’s vaunted freshman class, is easy to guess: his first initial is G, and thus it is only a few quick steps to arrive at G-Money. The second, Deebo, was given to him by senior Quinn Cook this past fall. When Cook first approached Allen after a practice to inform the freshman guard of his new moniker, Allen stopped to contemplate until Cook explained: it’s from the movie Friday, in which Deebo is an abominable, unrelenting tormenter who rules the protagonists’ neighborhood. “I was like aw, jeez,” Allen said on Sunday. “I’ll take it I guess. I’ll take being a bully on the court ... The aggression and effort that I play with can be annoying.” Allen said this from the seat in front of his locker during a one-on-one conversation, which can be a rarity amid the media throngs that often turn Final Four locker rooms into mosh pits, especially on a team with just eight scholarship players, five of whom were elsewhere. Yet Allen was easy to corner that afternoon, as so many notebooks and cameras were occupied with his more high-wattage teammates. Perhaps even to outsiders Allen’s breakout should not have been a total shock. Overshadowed as he may have been by classmates Jahlil Okafor, Tyus Jones and Winslow, Allen was no scrappy overachiever that Krzyzewski plucked from a bin destined for D-III. He was a 2014 McDonald’s All-American who won that game’s slam dunk contest by jamming while leaping over first Winslow and Jones together and then just the 6’11” Okafor. He committed to Krzyzewski as a junior because he grew up a Duke fan, not due to a lack of options: Florida, Florida State and Texas were also among his bevy of suitors. Once in Durham he proved instantly popular at Cameron Indoor Stadium, where a sign paid tribute to FIFTY SHADES OF GRAYSON. "It embarrassed the heck out of him,” said Mickie Krzyzewski, Mike’s wife. “His mother didn't like it at all." 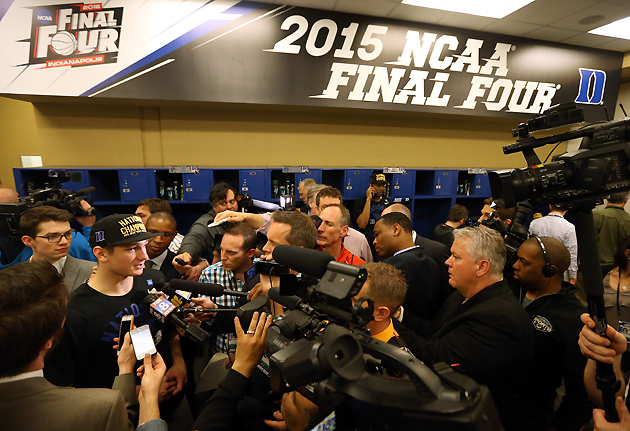 After national championship game, what's next for Duke and Wisconsin? What Allen didn’t like, at times, was his role. He spent most of his first few months glued to the bench (including zero minutes in Duke’s first win over Wisconsin, in December), where he would often be disengaged and slip into what he calls “spectator mode.” There were numerous heart-to-hearts with Scheyer and Krzyzewski, who continually hammered a point that seemed far-fetched: Stay ready. Your time is not next year. Your time is now. His role began changing a month into ACC play, when the Jan. 29 dismissal of guard Rasheed Sulaimon necessitated an all-hands-on-deck approach. His minutes still yo-yoed—from three against Georgia Tech on Feb. 4 to 16 against Notre Dame three days later, from four against North Carolina on Feb. 18 to 18 against Clemson on the 21st—but “you could see his confidence grow,” said Scheyer. There was a 27-point outburst in a March 4 blowout of Wake Forest and a soaring dunk in Saturday’s semifinal win over Michigan State. After what he did on Monday, Deebo will be forever beloved in Durham.